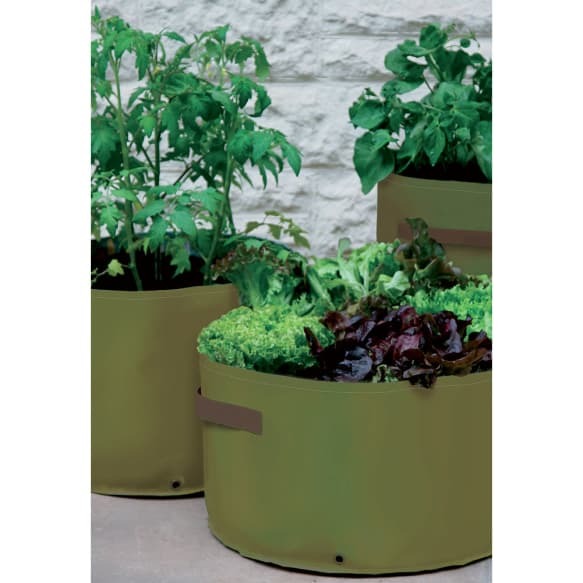 Specially designed for use on patios, balconies and in small gardens, each pack of Vegetable Patio Planters contains three planters of different depths - deep, medium and shallow - ideal for different types of vegetables. Deep = Height 45cm Diameter 35cm Medium=Height 30cm Diameter 40cm Shallow=Height 25cm Diameter 45cm. 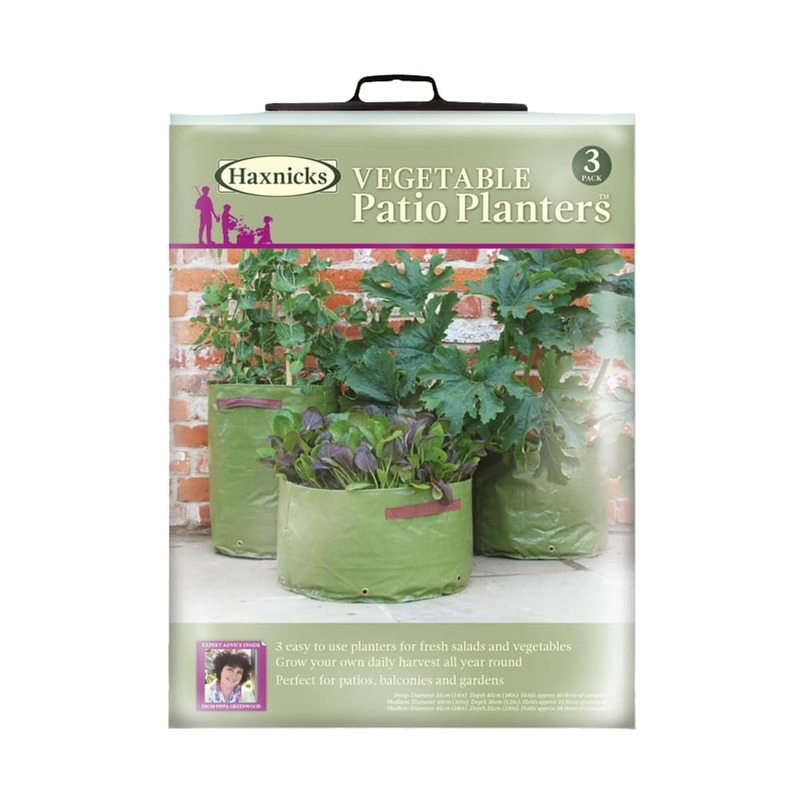 It's so easy to grow your own vegetables with Haxnicks Vegetable Patio Planters. Made of a tough polythene with reinforced drainage holes and handles on each side they fold flat for easy storage and can be reused again, and again. Each pack comes with a helpful growing guide with lots of handy advice including a list of varieties suitable for each container and how many to plant in each. Helpful Haxnicks hint: add gravel to the bottom of the planters to improve drainage. Place a layer of gravel, broken pots or other suitable material into the bottom of the planter to help drainage. For the Deep Planter use larger stones for drainage & stability. Fill with good quality multi-purpose compost to approximately 4cm (1½ ins) height from the top of the planter. Follow instructions on seed packets if sowing direct, remembering to thin out seedlings when large enough to handle. You can maximise the number of plants per container according to their spread. Usually more plants will produce fashionable mini-vegetables. Water plants before planting, and allow to drain. Do not place outdoors until after last frosts, or keep in the light, in a frost free situation. Water regularly and do not allow the compost to dry out. Feed regularly from mid summer with a good liquid feed or use a slow release fertiliser following manufacturer’s instructions. Choose the varieties to suit the depth of our different size containers. You can use our simple guide to help you. It’s very easy and perfect for children. Enjoy the satisfaction of picking your own tasty crops straight from your Vegetable Patio Planters, knowing exactly how they have been grown. Most garden centres and mail order catalogues sell ready grown young vegetable plants, so choose the varieties you like, use our suggestions, or keep costs to a minimum and start your own tasty vegetables from seed, indoors in pots on the windowsill. Seed packets or plant labels usually indicate if a variety is particularly suitable for container growing, but look out for compact growing vegetables that have ‘bush’ or ‘patio’ in the name, and with eye catching crops and flowers. Tomatoes make a perfect patio crop, just try and resist eating them before you have a chance to get them into the kitchen. 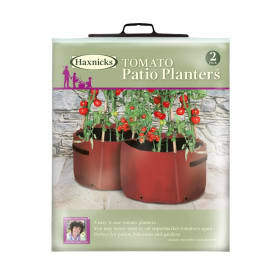 Grow a mixture of yellow and cherry red varieties for a fantastic effect. Leaf salad mixes are fast croppers ready to eat just a few weeks after sowing, and will re-grow up to 4 times if you trim the foliage and leave the base intact. Cut and come again lettuce varieties are perfect container subjects, and easy to grow from seed. Mini vegetables are succulent and all the rage, go ‘mini’ with sweet corn, beetroot, carrots, spinach, and parsnips. Mange Tout (eat all) peas have fantastic flavour and so crisp and tasty raw in salads. Why not try something colourful and decorative as well? Try ‘rainbow swiss chard’ or shiny ‘chilli peppers’ in a wide variety of deliciously hot colours. Courgettes are not only full of nutrition but are available in vibrant yellow and gold, bringing a taste of sunshine to your plate. Try something exotic, like Chinese vegetables or oriental leaves, Pak Choi, or beautifully dark aubergines to impress family, friends and neighbours with your culinary vision. Squashes come in all sorts of wonderful shapes and colours and so much fun the kids will love them. Add a touch of the Mediterranean to your salad bowl. You can grow edible flower varieties such as peppery nasturtiums or pansies, seed catalogues list plenty of colourful ideas. Growing plants from seed in pots on the windowsill will keeps costs to a minimum. A layer of mulch (e.g. chipped bark) around the top of the compost will help conserve moisture and help prevent weeds growing. Move planters to a semi shaded spot at the height of the summer. Watch out for slugs & snails once the seedlings appear. Try sowing some more seeds indoors, or have more plants for follow on crops. 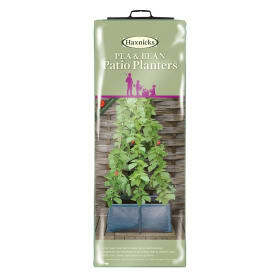 Feed tomatoes and peppers weekly with a high-potash fertiliser as soon as the fruits start to form. Pinch out tops of tomato and pepper plants to encourage bushy growth and lots of fruit. 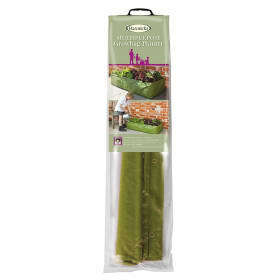 Support Peas, French Beans and Cucumbers with canes or twiggy sticks. Grow French Marigolds for extra colour and to deter aphids.